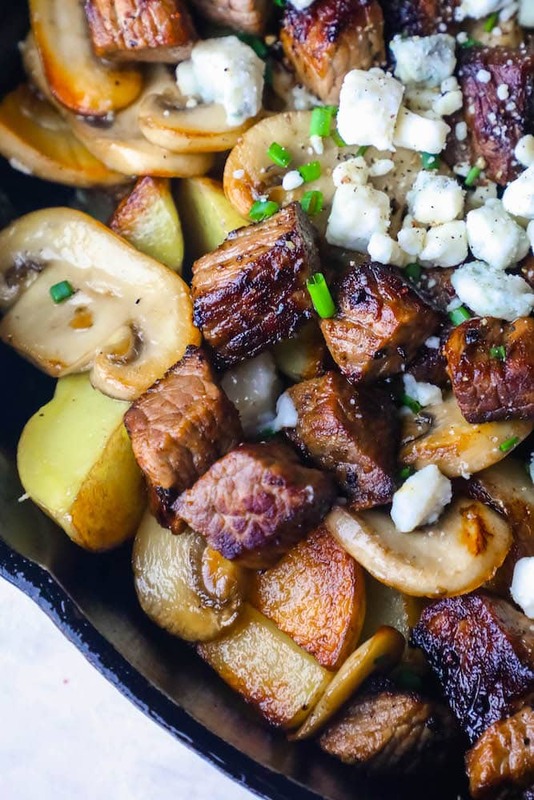 Blue Cheese Steak Bites and Potatoes Skillet Dinner Recipe – delicious hearty garlic butter sirloin steak cubes with roasted potatoes and mushrooms, covered in crumbled blue cheese for an easy, delicious dinner the whole family loves! 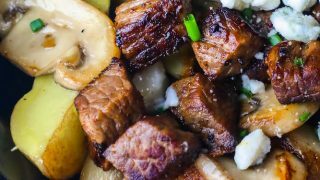 This is an entire steak and potatoes skillet dinner – steak main course and mushroom and potato sides – in just one skillet! 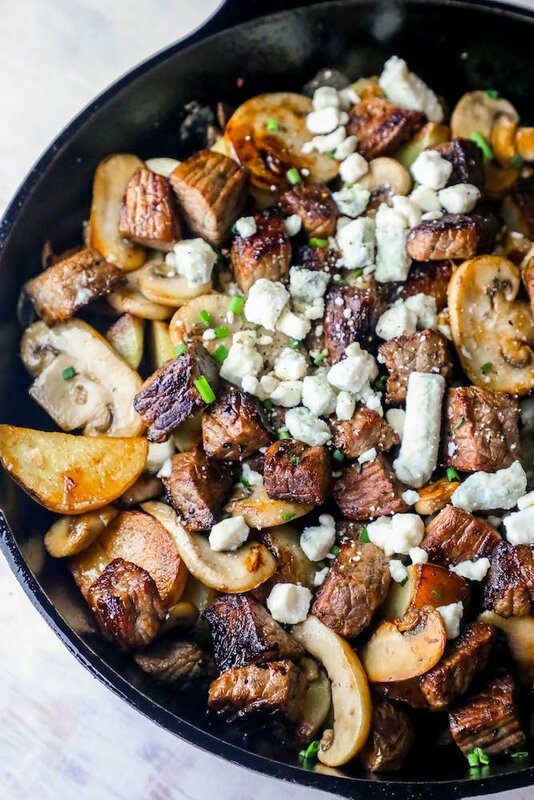 Seriously – delicious crispy sautéed potatoes, meaty mushrooms, creamy blue cheese crumbles, and hearty steak – all in one cast iron skillet! This steak bite skillet is a hearty and delicious dinner that the whole family will love – and you won’t feel bad making since it uses fresh, whole, and natural ingredients. 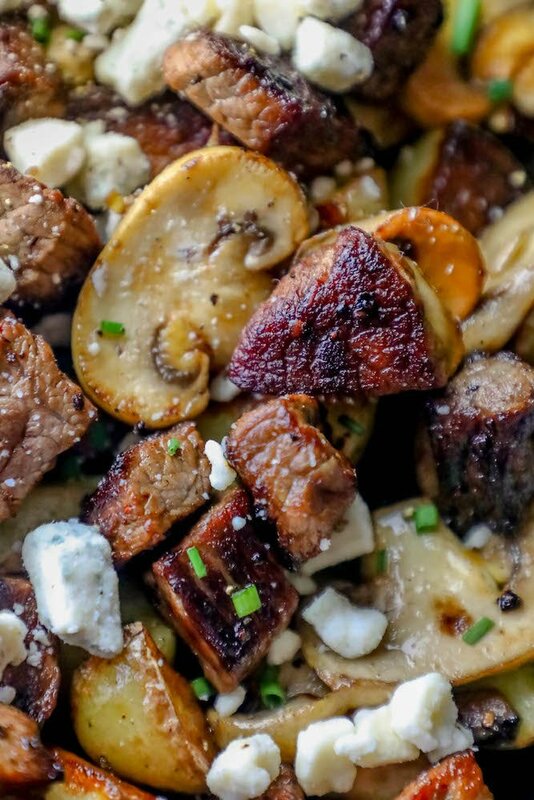 There are also keto and low carb swaps I am including in the recipe notes, if you want to make a keto steak bites and mushrooms skillet with blue cheese! 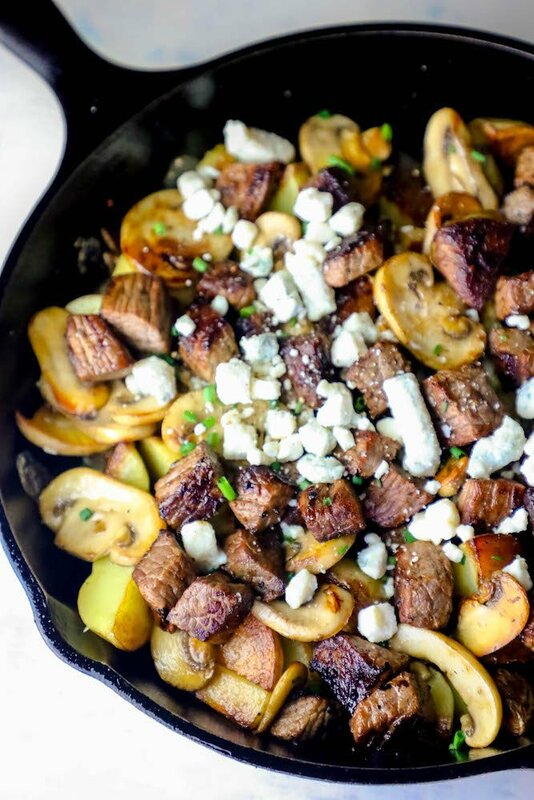 If you love big, bold, beefy flavors – this blue cheese steak bites and potatoes skillet dinner is for you! 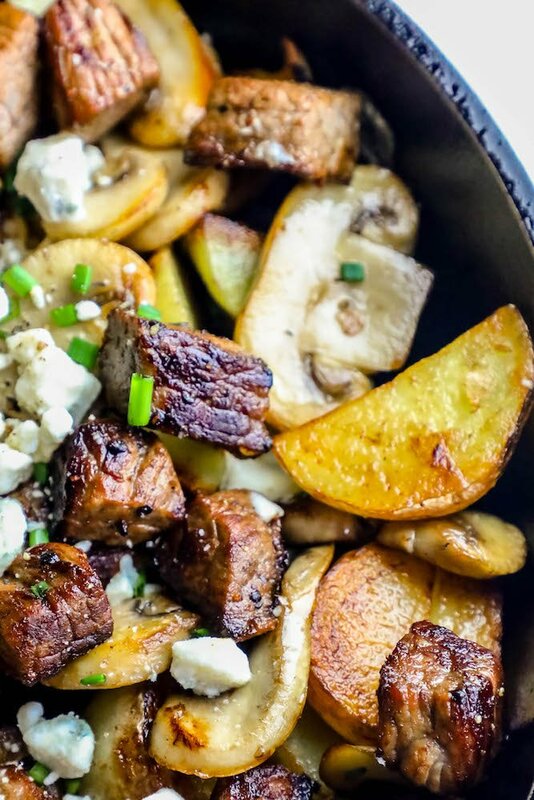 Just Take Me To The Blue Cheese Steak Bites and Potatoes Skillet Dinner Recipe Already! If you’d like to skip my helpful tips and tricks and get straight to the easy blue cheese steak bites and potatoes skillet recipe, please scroll to the bottom of the page where you will find the printable recipe, just above the comments. Delicious, juicy, and tender steak isn’t made by accident – steak can be tough, chewy, and dry when not cooked right. While this steak bites recipe does reduce cooking time by making smaller bites of steak, the cooking can be a bit more complicated by adding other ingredients into the cast iron skillet. These Tips will help your blue cheese steak bites and potatoes skillet dinner to be packed with tons of flavor from perfectly cooked steak! -Slice potatoes thin before cooking. Since potatoes take longer to cook, it is important to cut your fingerling potatoes to small bite sized slices. This will help the potatoes cook faster and crisp up more. Steak responds best to fast cooking with a very high temperature. For the best results, I like to cook the potatoes first to crispy – which will help the cast iron get nice and hot as the potatoes cook. When the potatoes have softened and crisped up, remove to rest, covered with foil on baking sheets, and then add bite sized steak chunks to pan and sear on high heat. When Steak has browned on all sides, add mushrooms, salt and pepper to pan and toss in olive oil. When mushrooms have started to brown, add potatoes back to pan and mix. Sprinkle with blue cheese and then enjoy! For this recipe to give the best tender and delicious steak flavor, it’s important to cut your steak into small 1″ bites – allowing it to cook faster without making the steak get tough or dry. Trim off the excess fat from the meat, and then cut sirloin steak into strips that are just less than 1-inch wide. Cut strips into 1″ cubes, trying to keep the shape and size of the steak cubes uniform so they can cook evenly at the same time. If you see any more large chunks of fat, gristle or long silvery membrane, remove them from sirloin steak before cooking for best texture and taste. 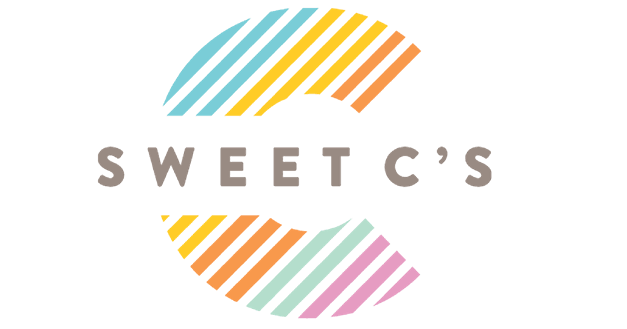 What temperature to cook steak to is a hotly contested subject – and in the end, your personal preferences will determine whether you’d like your steak bites cooked to medium rare, medium, done, or well done. No matter how you prefer your steak, this recipe is easy to get the temperature you love, in just one pan! For Best results, I like my steak bites cooked to medium rare – seared on the outside and a touch red in the middle. A medium rare steak bite will cook in about 4 minutes if you’re using high heat, stirring occasionally to prevent burning. Rare steak will be very soft to the touch, almost “jello” like. Medium rare steak will have a bit firmer texture when pressed, but still has some give. Medium steak will be much firmer to the touch and have reduced slightly in size. Well done steak will be much firmer to touch, and will have reduced in size. If you’re following a keto or low cabr diet, potatoes aren’t a part of your healthy eating plan. Luckily, this recipe is an absolute knockout with a couple easy low carb ingredient swaps – you won’t miss the potatoes and all the carbs that come with them! For best results, I recommend swapping the potatoes out for one head of cauliflower, trimmed into florets. Continue with recipe as detailed below, just cooking cauliflower in the place of potatoes. If you’re not a fan of cauliflower, you can also swap out zucchini, bell peppers, or eggplant, cut into bites, and cooked as described for potatoes below. Or you can visit my One Pot Meals Essentials Amazon List to find everything I use when making my favorite one pot dishes! 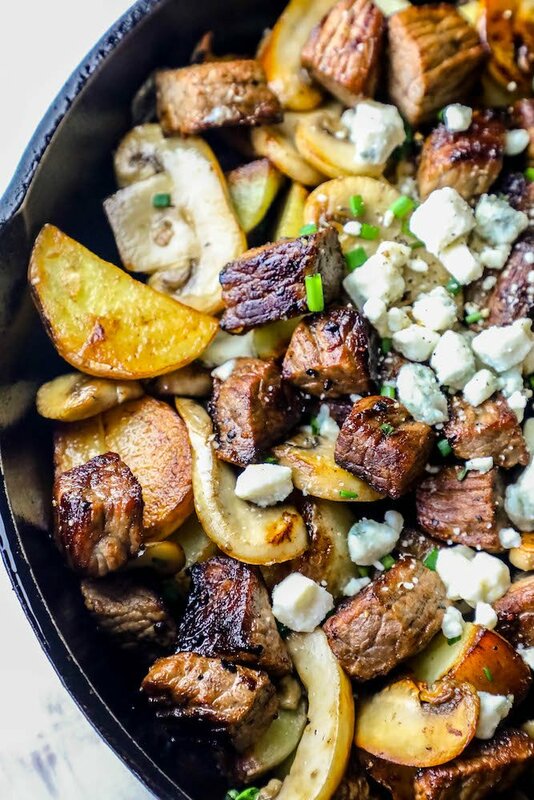 If you love this Blue Cheese Steak Bites and Potatoes Skillet Dinner Recipe, you’re going to love these other tried and true one pot dinners! If you love this blue cheese steak bites and potatoes skillet dinner recipe as much as I do, please give it a five star review and help me share on facebook and pinterest! Blue Cheese Steak Bites and Potatoes Skillet Dinner Recipe - delicious hearty garlic butter sirloin steak cubes with roasted potatoes and mushrooms, covered in crumbled blue cheese for an easy, delicious dinner the whole family loves! In a well ventilated area, heat large cast iron pan on stove until scorching hot to the touch. Melt 2 tbsp butter in pan. Add sliced potatoes to pan and cook, stirring occasionally to prevent burning, until crispy golden brown - about 6 minutes. Remove potatoes from pan and lay on metal baking sheet, covered in foil. Generously sprinkle salt and pepper over sliced steak bites. Add other 2 tbsp clarified butter to pan and swirl to melt. Add steak bites to pan, making sure they aren't overcrowded. Sear on each side until browned all over, about 3 minutes, and add mushrooms to pan. Stir to cook until mushrooms have slightly browned. Add potatoes back to pan and sprinkle with Italian herbs. If needed, drizzle with olive oil to toss and continue to cook for 1-2 minutes until steak is at your preferred doneness. When steak is cooked and potatoes are golden brown and crunchy on the outside/soft in the middle, top with blue cheese crumbles. Top with chives if desired. This meal looks like a real heart stopper. I am sure it has super flavor but I must skip it do to nutrional values. I am dying to make this again! Thanks so much! I truly can’t imagine anything I’d rather eat! This has such great flavor and textures! Im so excited that I have everything to make this for dinner tonight. Your instructions are so clear I just know Im going to LOVE it! Oh my goodness, this has “YUM” written all over it! This looks amazing – I love steak + blue cheese together. And the fact that is all made in one skillet = winning!